In the west of the island is the resort of San Antonio, famous for its lively bars and clubs, vibrant energy and sublime sunsets. Once a small fishing village for almost 2000 years, San Antonio (Sant Antoni in Catalan) is now a top holiday destination, loved for its relaxed and easy-going feel. You can listen to the world's best DJs live, stop and take in a dazzling glowing sunset or take to the water in a huge variety of ways. It is set in one of the largest and most beautiful natural harbours in Europe, San Antonio Bay, an open expanse of calm waters. Add to this big blue skies and rolling hills and you get a stunning and graceful backdrop for a very lively and fun-filled resort. Running through the main part of town and approaching the marina and port is the elegant central palm-tree-lined promenade filled with plants and flowers and large fountains that light up at night. You will find a big selection of pavement-side restaurants and cafés that lead right past the harbour. In the other direction, the promenade follows the line of the main beach of San Antonio, S'Arenal, a long strip of soft sand with safe, shallow waters. You can play about in the water with ease amongst a largely young crowd from dawn till dusk in the summer. Further along the Bay, following the promenade away from the town centre, is the cute and quieter beach of Es Puet, also great for watersports. In the other direction from the central promenade and past the Sunset Strip, you will come to a small stretch of sandy beach called Caló des Moro right next to the super-chilled lounge Golden Buddha Bar. Just a 15-minute walk from here, going west, is the lovely beach of Cala Gracio and its charming neighbour Cala Gracioneta with a relaxed restaurant. If you want to explore more beaches, the west of the island is blessed with many beautiful bays such as Cala Conta, Cala Bassa and Cala Salada, all of which can be easily reached by car or bus from San Antonio - or by little ferries, by far the nicest way to reach these little gems. There is almost another town on the water in San Antonio. You have many water activities, boat trips, boat parties and ferries that leave from here. You will find stands selling tickets for all of these next to the water in front of the central promenade. From simple hotel shuttle services to ferries that take you to just about all the beaches of the west, as well as trips to Formentera and the mystical island of Es Vedra, the town is an excellent point to access the island. You can do just about every water activity under the sun, have a day of fun at Ocean Mania, the inflatable water park in the bay or even learn how to surf on the artificial wave machine at Surf Lounge. For the true adrenaline addict, you can take to the skies and waves on paragliders, jet skis and more. Also on land, there are lots of great fun things to see or do so check out our activities page for San Antonio. 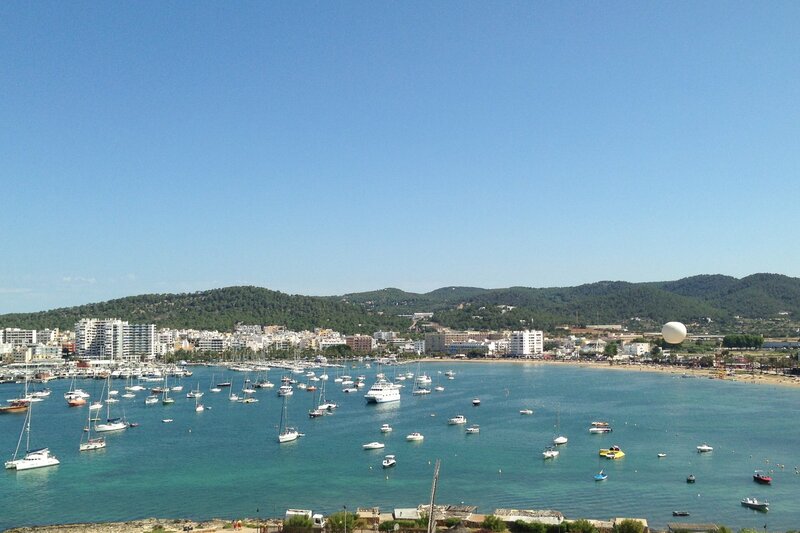 San Antonio is one of the main start points for Ibiza's renowned boat parties, which run throughout the summer. You can go on afternoon or sunset excursions, then dance under the sun or stars to great music for an extra special pre-party experience. For many, the legendary bars of the famous Sunset Strip have helped put San Antonio on the map. Café Mambo is the leader of the sunset bars on the Strip and is famous for its music sessions, featuring the world's best and most prolific DJ talent. It is also home to Café del Mar, the original sunset bar, famous worldwide for its chill-out compilations. Along the promenade there are many more sunset bars and in summer the whole island flocks here to watch the sun go down when it displays an incredible spectacle of colours. A walk down here is a must for all Ibiza holidays and will literally lift you with the buzzing energy of the strip. At night, San Antonio transforms into party central with lots of great bars on the beachfront walkway such as Itaca which has a friendly groove and great drinks' prices; or you could opt for the more glamorous bright white decor of Bay Bar. In the centre of town, you will find the cluster of bars, micro-clubs and pubs that is the West End. Here, enjoyment is always on the menu supported by what are very reasonable drinks prices and lots of animation as party people make their way around the narrow, pedestrianised streets from bar to bar. Clubbers should know that the town is host to the exquisitely-styled pyramid of renowned super club Es Paradis as well as the recently revamped Eden right next door. Fans of daytime clubbing can head to O Beach Ibiza, a beautiful beachclub on the promenade with a diverse party programme. And the Ibiza Rocks Hotel, which is also a venue, is famed for its daytime pool parties. The other famous clubs of the island, such Amnesia and Privilege are near San Rafael in the middle of the island, while Pacha is in Ibiza Town and Ushuaïa and Hï Ibiza are in Playa d'en Bossa. All are also easily reached with the disco bus that runs all night. Read more in our extensive Clubber's guide to San Antonio. There is a fantastic selection of snack bars and restaurants in San Antonio lining the promenade and squares for all tastes and budgets - mostly offering stunning views over the harbour and bay. Right by the marina is Villa Mercedes open day and night, all year long, whilst nearby, Rio Ibiza offers a lovely terrace with fabulous views. In the small lanes behind the fountain square is one of the most respected tapas places on the island, Rincón de Pepe. Flaherty's Irish Pub has great pub grub, shows all the major sports' events and has a welcoming atmosphere. In the sunset bars of Savannah and Café Mambo you can dine while the sun is setting in a feast of colours. In the beautiful surroundings of San Antonio, lovely rural restaurants offer a change of scene, like Sa Soca for traditional food or Sa Capella, a fine-dining restaurant in a beautiful old former chapel. San Antonio's diverse range of accommodation covers all budget options from large four star hotels and charming hostels to self-catering apartments, all with great atmosphere and personal service. Economic but comfortable options are the traditional, family-owned Marí Hostel and clubber's favourites Florencio Hostel. Near the Sunset Strip and the small beach of Caló des Moro the amazingly decorated brand new adults-only Wi-Ki-Woo Hotel opened in June 2018 offering some stunning sunset views. Right next to it the Sol Bahía Apartments with sea-side pool terrace also just been been renovated for summer 2018. Only a few steps further towards the beautiful beach of Cala Gracio you'll find the Cubanito Ibiza Suites, also brand new for 2018, an Art Deco hotel only for adults, with panoramic views from its rooftop bar with great events such as salsa evenings. If you want a quieter, more tranquil stay then the hotels and apartments further along San Antonio Bay, going south, are only a short stroll along the beach promenade from the town centre. Our tip for clubbers who want to unwind in stylish surroundings are the Puchet Hotel, the Apartments Marina Playa, Sol House, by the renowned Melia hotel group, as well as the Paradiso Ibiza Art Hotel. Or try the other direction, on a cliff top on the west coast just behind Cala Gracio is Hostal La Torre, part of the Mambo group. It offers a heavenly retreat with a great restaurant and stunning sunset views. Out of town in the countryside you will find many private holiday villas which make a great option for groups and large families wanting fast access to San Antonio but also extra privacy and tranquillity. When you arrive in town and come to the first roundabout, you will see a large white egg with a ship inside it. It is the egg of Christopher Columbus and the ship is the famous Santa María on which he embarked on his journey to the New World. It has been suggested that he was a famous son of San Antonio in the book Colon Ibicenco. Author Nito Verdera is adamant that it is true - either way, it certainly makes for a great story. So, why the egg? Well, Columbus was told that reaching India was impossible on one of his fund-raising missions to finance his audacious voyage. He responded by taking an egg and asking if it was impossible to stand the egg upright. Everyone agreed it was, so canny Christopher lightly cracked the base and made the egg stand upright. “Nothing is impossible,” he said, thereby winning the support of the financial backers. The rest, as they say, is history.